What happened to Congresswoman Ilhan Omar was troubling. On the one hand, because she dared to challenge the way supporters of Israel have worked to silence debate on U.S. policy toward the Israeli-Palestinian conflict, she became a victim of incitement and the target of legislation meant to shame her. At the same time, however, the heavy-handed tactics employed against her by some pro-Israel members of Congress backfired, exposing new fault lines in the U.S.-Israel relationship. The weapon of choice utilized by Omar’s opponents was to demonize her as an anti-Semite. Her “sin”, it appears, was her continued umbrage over the double-standard that exists in American policy toward Israel and its treatment of Palestinians. Never, in all this time, was there a critical examination of what she actually said. In fact, she never accused the Jewish community of controlling the media (unless one assumes that Israel’s ability to dominate media coverage of events occurring in the occupation can be attributed to the Jewish community). Nor did she accuse the Jewish community of using money to buy influence in Washington (unless one suggests that AIPAC speaks for and acts on behalf of the entire Jewish community). It didn’t matter; her opponents continued to call her an “anti-Semite” and did so with such frequency that the term stuck, putting her at risk to threats of violence from bigots. The reaction to this newest “sin” was near hysteria. Without ever listening to what she actually said, some members of Congress accused her of saying that the Jews had dual-loyalty — despite the fact that she had said no such thing. They demanded that Omar be censured or removed from her committee posts. 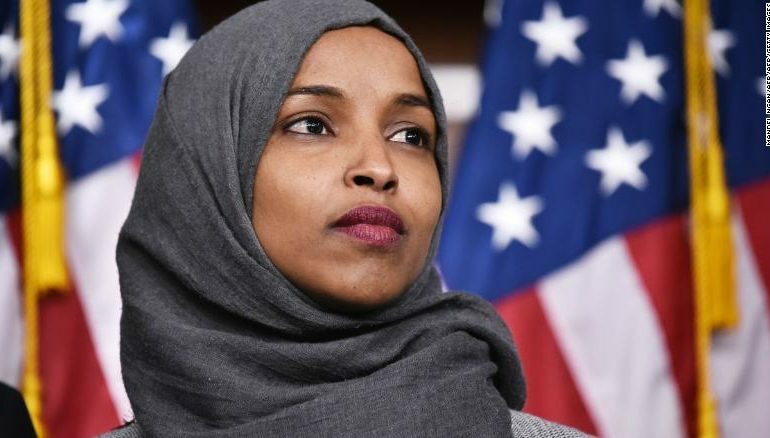 And the chairman of the Foreign Affairs Committee proposed a resolution that would have denounced anti-Semitism in a way that was clearly directed at the congresswoman. Because Omar has touched what some have come to say is “the third rail of American politics”, she was being exploited by some Republicans and hung out to dry by some Democrats. They put a target on her back. And haters were quick to respond with frightening death threats and shameful bigoted assaults on her as a Muslim woman. There is no question that these threats against Omar were the byproduct of the sustained campaign of incitement. And secondly, it is clear that Omar’s courage has helped to open a door enabling a discussion of Israeli policy and the U.S.-Israel relationship. While her opponents attempted to slam it shut, it seems that their behavior and incitement against her backfired stirring a debate that has helped to pry the door even further open.